Doing the Macarena, snapping up shares of Bre-X and dot-com companies, touting the primacy of palm pilots and DVDs while bracing for Y2K: It all once made so much sense, till it didn’t – much like protesting new bike lanes. In the 1990s, I commuted by car from a Beach-area home to downtown jobs, and why not? I had access to free parking and the thought of having to rely on the streetcar was more than I could bear. So it shouldn’t surprise you that I once was “one of those”, predicting the worst should cycling activists win their fight to have bike lanes installed on Dundas, between Broadview and Kingston Road. Looking back, I’ve had to laugh at myself, especially since becoming a year-round bike commuter on those very lanes over the past six years. 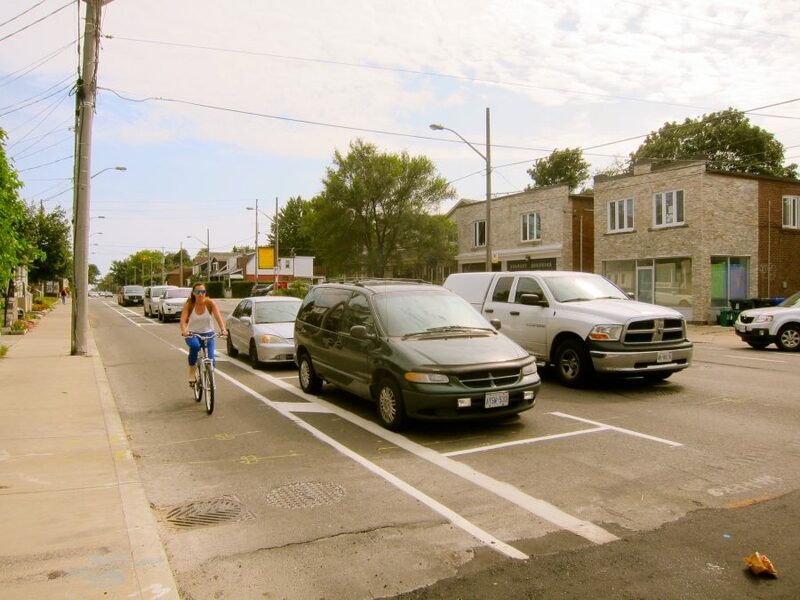 The Dundas bike-lane idea surfaced in earnest in the late 1990s and became reality in 2003 after intense debate. Reread the media coverage from that era and you’ll be struck by how opponents’ arguments are indistinguishable from the ones now being made regarding new bike lanes on Woodbine, between Queen and O’Connor. Then as now, amplified by alarmist headlines, the gist is that traffic will become a nightmare, prompting drivers to spill into and speed on residential streets, endangering kids. Congestion already is a nightmare for the car-dependent (and for those trying to run transit systems). It always will be as long as the city remains a magnet. Widening roads only makes things worse in the mid-to-medium term. We’ve proved repeatedly that peak-hour traffic always fills, or slightly overloads, available road space – especially if it’s free. It happens whether or not bike lanes are added to the mix. Reckless and negligent drivers on side streets are already creating big danger all over (including on the street where I now live, near Danforth and Coxwell, nowhere near any bike lanes). Frustrated drivers who are willing to endanger kids on your street are criminals, even if the law still treats speeding largely as a peccadillo. It’s a crime of opportunity and the criminals’ potential presence highlights the need for more speed humps and turn restrictions, especially since police will never have the resources to properly enforce such essential laws. It’s true that the Bloor bike-lane pilot project has forced the city to address perceived and possibly real concerns about traffic spilling into side streets in the west end’s Seaton Village neighbourhood. There will undoubtedly be an adjustment period near Woodbine (last week, Ward 32 Councillor Mary-Margaret McMahon told Metroland that there could be “tweaks”), but it’s not a reasonable argument for denying safe options to cyclists and, more important, would-be cyclists who could be leaving cars at home, freeing up space on roads and in overloaded subway cars. Surprisingly – as someone who still sometimes drives in the city – I’ve found Dundas a better thoroughfare with bike lanes, even when I’m in my car. Travel-time increases (and I once kept detailed records) turned out to be insignificant, while the left-turn lanes added along with bike infrastructure have reduced the need for drivers to constantly switch lanes. Note that on Woodbine, long-overdue left-turn lanes are being added as part of the cycle-lane project. I’ve heard complaints that existing bike lanes on Dundas and across the city aren’t being used enough, but that says more about the overwhelming abundance of destinations still beyond Toronto’s piddling bike-infrastructure offerings; cities the world over, including many that get real winter, have shown bike-lane usage grows exponentially the more the lanes create a true network. Woodbine’s lanes (along with access created by changes at Corley and Norway) will give residents from deep in eastern East York and the old city’s East End access to the Dundas route right into the core, where, admittedly, a shortage of bike parking is a burgeoning problem (even sometimes when the weather’s not that nice). Woodbine was never the ideal; most cyclists would prefer to ride quieter north-south side streets. Alas, in our area, none of them cross GO’s rail corridor. Even the major streets that do are few and far between. Coxwell, the only other option, has streetcar tracks that left the city little choice. Potential cyclists fearful of Woodbine’s hill might be amazed how quickly their legs, lungs and outlook strengthen. There will be reduced car parking on some stretches, but increases north of Danforth, where the project is part of an attempt to revitalize retail spaces that suffered for decades as cars sped past. More opportunities to lock up bikes should make it easier for residents to make use of main streets for more than transportation. There will be an adjustment period, tweaks may be needed, and the traffic-evaporation process may take months, but the world’s most livable cities are all moving in this direction for good reason. This column is part of a recurring series tackling urban issues through an east-end lens. Connect with Stephen Wickens on Twitter @StephenWickens1. Thanks for the article. I think the reality is we have excess road capacity most of the day, even in rush hours. Dundas could carry about 1800 cars per hour with two car lanes in each direction It was carrying about 1000/ hr in rush hour. Today we have about 500+ cyclists in one hour (compared to 15 pre bike lane) with room for more. That cycling capacity could have been lost had we stuck with two car lanes in each direction. More reserved cycling lanes now will ensure a sustainable equitable transport system for future generations. Interesting points. I’m betting the Dundas lanes see another significant bump over the next few years. Great article – your point about congestion already being a reality, and travel time concerns being overblown, bear out my own observations. Watching one of the intersections, it is apparent that a few tweaks will make a lot of difference. Such high density demands co-existance, and it is great to have options multiply, instead of being used to divide Torontotonians. I suggest someone look at demographics to assess how many 65+ seniors are riding bikes vs needing safe places to park or even just unload from wheel trans. Taking away two lanes for automobiles in one of the few fast moving streets in the area, having cars park in the middle of the street and increasing congestion so that a handful of bike riders can have a lane to themselves in the middle of January – who wouldn’t agree with that? I prefer the new approach. I live very nearby queen and woodbine and have long wondered why we needed a 5 lane road to connect the two 4 lane roads, Kingston and Lakeshore. The old 5-lane roadway certainly made less sense than this new approach. I stopped commuting by bike many years ago because of the dangers posed by cars and trucks despite of my own extreme caution. A real bike lanes network has me rethinking that decision. Bike lanes should never have happened on Woodbine Avenue which has one of the busiest volume of both pedestrians and vehicular traffic. The new car park spaces are confusing to motorists as they are familiar with two lanes and for vehicles going north on Woodbine they have to zig and zag as per the new painted road lines. The point is, that millions of dollars were spent on this yet as you walk along Danforth Avenue at Woodbine and the sidewalks are absolutely filthy along with tree containers full of garbage. This is how much both Councillors Davis and McMahon care about the majority. I think these lanes are great for pedestrians – creates a buffer between those death machines and the sidewalk. Much more civilized to walk up and down. Regarding Councillor McMahon’s comment in the September 19th issue that the Woodbine bike lanes could be “tweaked” for easier waste pickup makes one wonder how much forethought and planning when into the idea in the first place. Yet another example of negative fall-out from the lanes is that they’re pushing more traffic onto the side streets east of Woodbine, and at least two of them don’t have any traffic calming measures in place, so this issue has just added to an existing problem. I am not against bike lanes but it’s a simple fact that some people need a car to get around, and Woodbine was an important artery in getting them where they needed to go. And just wait until the winter , when snow and snowplows are added to the mix. Southbound traffic through morning rush hour has actually improved at Woodbine and Gerard. Alas – northbound from Kingston Rd. to Danforth during evening rush has not. There may be some complication from the Queen and Coxwell closure moving volume into these channels – I’ll wait another two or three weeks following the reopening of that intersection to pass judgment. Finally we get some decent cycling facilities in our neighbourhood and the NIMBY crowd comes out in full force with a “chicken little” mentality and a petition for their removal – pathetic. Bikes aren’t the problem it’s the cars, where they’re parked and the people driving them that cause chaos in our community. Are they really NIMBYS or are they just using our neighborhood as a highway to downtown? Twice in the last two weeks now it’s been faster to walk home from woodbine station to queen and woodbine. This might force me off the TTC and back to my car to commute as the reliability of the bus route is way down. Nice greening of the city! The roll out and back up plans for the bike lanes are lacking. Signage warning of SINGLE LANE AHEAD, expect delays is needed. Since Woodbine is now single lane traffic, maybe signs that read LOCAL TRAFFIC ONLY, along with suggested alternatives. These alternatives would not include Coxwell which has a hosptial on it and Victoria Park is also single lane south of Gerrard. Surely there was some thought given to this at the planning stages to share with drivers forthwith. Another issue is Southbound Woodbine, south of Dixon , the bike lane symbol is all but ignored. It is an accident waiting to happen. The bike lanes should be ended officially at Dixon OR bike poles installed straight away. Perhaps cars currently fill up the bike lanes on these final few blocks as cyclists have already veered off and gone through the more placid Triangle, through the Former Race Track Area to a PROPER prototypical bike path, The Martin Goodman Trail.